This is the first of a series of posts that cover my travel To Greece and the USA in April and May 2016. My sisters take me to the airport. Hugs, photos, more hugs and I go through security. Lambie and I are on our own. I shout myself a bottle of bubbles at an airport bar. A piccolo of Deutz. NZ$19 please. Onto the 777-300 and into the Premium Economy section. The ‘space seats’ are indeed spacious and there’s a pillow, blanket, headphones, water bottle and a vanity bag containing a toothbrush and a mini tube of tooth paste, eye shade, lip balm, ear plugs, a pen (but nothing to write on) and socks, which I put on. Lambie and I get comfortable. I put all the movies I want to watch into my play list and settle in as a glass of Villa Maria’s bubbles is served. 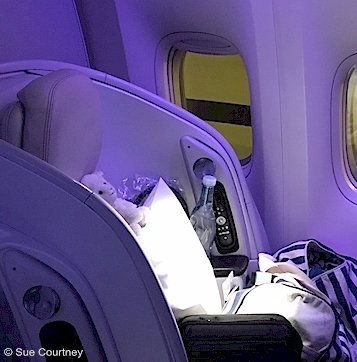 All of the wines for Air New Zealand’s Economy and Premium Economy cabins are from the Villa Maria Group with labels encompassing Villa Maria, Vidal, Esk Valley, Thornbury, Te Awa and Left Field. My request for a gluten free meal got lost. Perhaps because I changed my flights with my travel agent so many times. I don’t starve however. Theres no wheat flour on the steak and steamed vegetables. The bread roll has been taken off and I eat the cheese without biscuits. Fruit salad for desert. All is ok. I choose the Villa Private Bin Chardonnay but its a little light so I follow with the Vidal Pinot Noir, which is just right. The glasses are real glass of the stemless variety. All very nice. It’s a 12 hour 15 minute flight to LA, the first sector in the dark. I sleep well after dinner in the comfortable space seat. Somewhere on the journey we cross the international date line. We’ve travelled back in time. When we arrive in LA the time is approximately six and a half hours before we left. April 22nd 2016 is turning out to be a very long day. 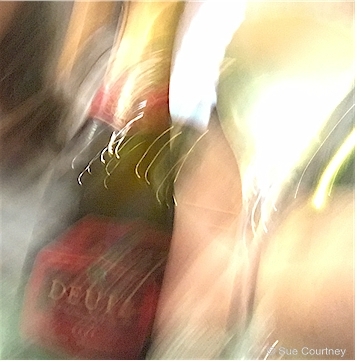 This entry was posted in #nzwine, bubbles, chardonnay, pinot noir, Travel, USA and tagged 2016, Deutz, flight, NZ2, Vidal, villa maria by Sue Courtney. Bookmark the permalink.